Why are fire-resistant privacy screening plants important? Because in high-density areas, vegetation between houses can either fuel the flames during a wildfire, or help to slow them. If fire-prone plants, like leland cypress, arborvitae, or italian cypress are used, they ignite easily and spread fire between structures. Intense fire behavior makes it difficult for firefighters to access defensible space and protect a home safely. Because fire-resistant plants are more difficult to ignite and burn, they are recommended for privacy screenings between houses. Remember: the best privacy is provided by interior curtain and shades! Not vegetation that can impact a home surviving a wildfire! 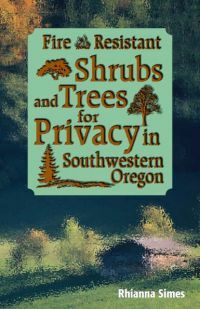 The 2012 OSU Extension Publication "Fire Resistant Shrubs and Trees for Privacy in Southwestern Oregon" booklet contains suggestions for shrubs and trees recommended for privacy plantings that meet a variety of growing conditions and requirements. Image: Row of burned leyland cypress, Oak Knoll Fire, August, 2010. Photo by Ali True.